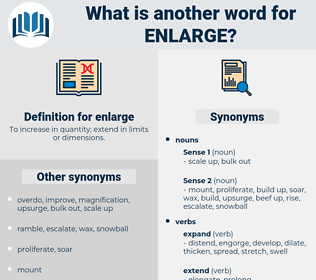 What is another word for enlarge? To increase in quantity; extend in limits or dimensions. 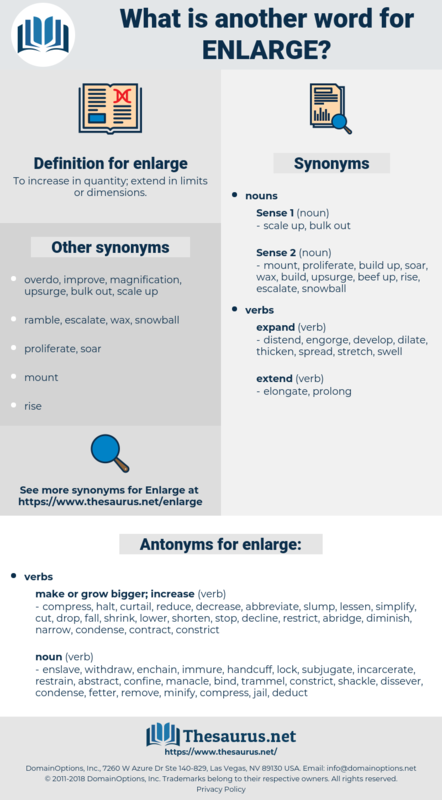 Extending, enhance, enlargement, expansion, expansions. augment, amplify, lengthen, deepen, aggravate, upgrade, develop, spread, enrich, exacerbate, intensify, boost, prolong, heighten, enhance, maximize, worsen, bolster, reinforce, reinforcing, accentuate, add, swell, inflate, stretch. compress, halt, curtail, reduce, decrease, abbreviate, slump, lessen, simplify, cut, drop, fall, shrink, lower, shorten, stop, decline, restrict, abridge, diminish, narrow, condense, contract, constrict. dissever, lock, restrain, shackle, jail, subjugate, trammel, minify, imprison, confine, intern, subdue, incarcerate, fetter, conquer, deduct, handcuff, immure, bind, manacle, wane, enslave, enchain, retrench, remove, commit, withdraw, abstract. But as the latter pursuit can hardly fail to enlarge a man's vocabulary, so the former adds to his knowledge, increases his stock of ideas, liberalizes his mind and opens to him new sources of enjoyment. We enlarge our field of observation through their eyes, profit by their experience, and learn not only from what they have enjoyed, but - which is still more instructive - from what they have suffered. deepen, ream, magnify, amplify, expand.